In 1989, with the help of director/producer Charles Pinsky, Pierre launched his national television career on public television with a cooking series entitled Cuisine Rapide." The series became an immediate success and led to a companion book of the same title, followed by three additional shows including Cooking in America" and Cooking in France," which won The James Beard Award for the Best National Cooking show in 1995, and finally Cooking in Europe." In 1994, along with Richard Flaste and Bryan Miller (both colleagues from The New York Times) Pierre wrote his memoir A Chefs Tale", interweaving his personal story with his passion for food, memorable meals, and favorite recipes. His final book, Pierre Franey Cooks With His Friends," was co-written in 1996 with his eldest daughter, Claudia Franey Jensen, as a companion to his public television series Cooking in Europe." The book was nominated for The James Beard Award that year. On October 15, 1996, at the age of 75, after conducting a cooking demonstration before a crowd of 400, Pierre suffered a fatal stroke on the Queen Elizabeth II while crossing the Atlantic with his wife, Betty. He died in Southampton, England and is buried along with her (2008) in Green River Cemetery in East Hampton, NY. Herbs are maintained at their gravesite by their children and grandchildren. 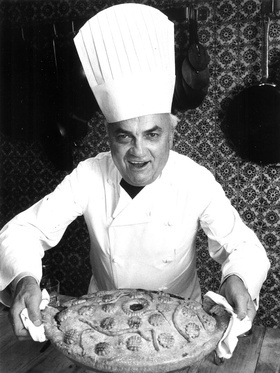 Pierre, decorated several times by the French government, including the National Merite of France, held an honorary doctorate from Johnson & Wales University, served on the boards of the Culinary Institute of America and Johnson & Wales University, and was a past president of The Vatel Club, a French food industry organization founded in 1913 in New York. He was honored by the March of Dimes in 1985 with a Hirschfeld caricature drawing for his extensive fundraising work for that organization. Scholarships are bequeathed in his honor at Johnson & Wales University in Providence, Rhode Island and The Culinary Institute of America in Hyde Park, NY.